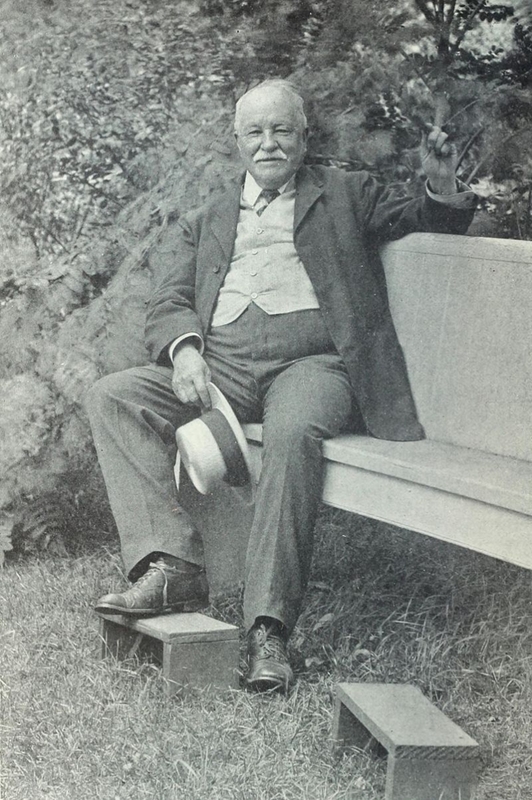 William Dean Howells, author, playwright, critic, was born in Martinsville, Ohio in 1837. During his childhood, Howells moved often around the state as his restless father took a series of jobs as newspaper editor and printer. Young Howells, who would come to be known as “The Dean of American Letters,” assisted his father from an early age acting as the printer’s devil. 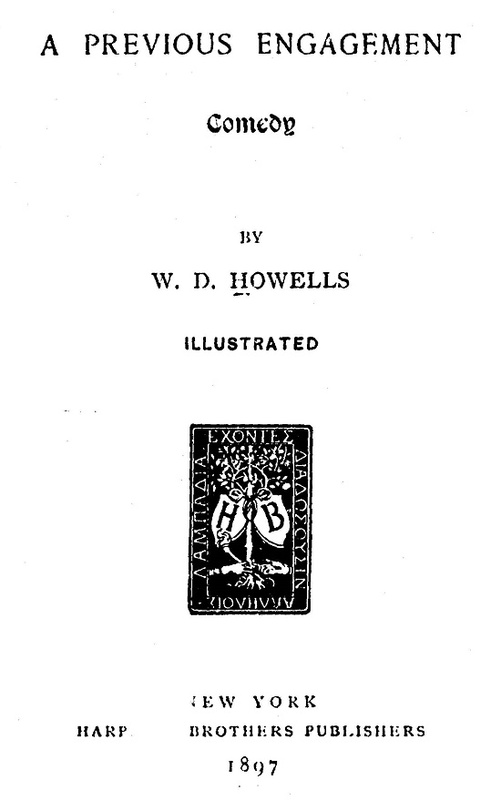 Howells began publishing novels in 1872, but did not achieve fame until ten years later with the release of A Modern Instance. 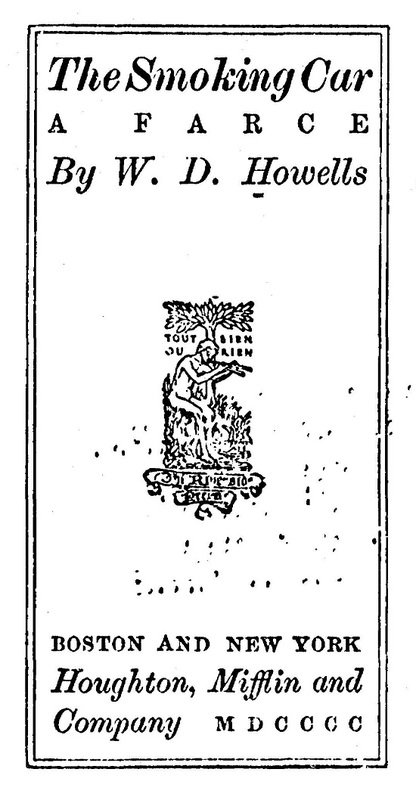 Subsequently, in 1885, his most widely known novel, The Rise and Fall of Silas Lapham, was published. 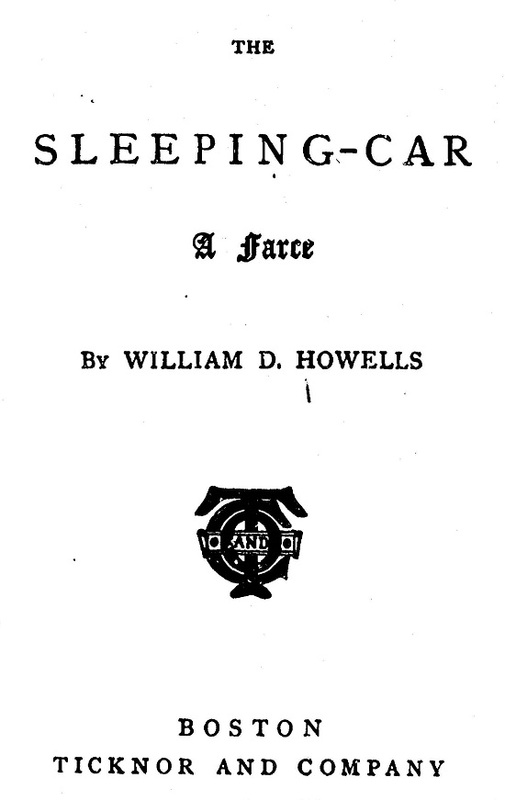 Beginning in 1888, Howells produced a series of novels that came to be known as his “economic novels” and which mirrored his transition to a philosophy of socialism. Influenced by Leo Tolstoy, Howells is recognized as the first American to infuse his fiction with a realist aesthetic creating novels and stories about prosperous Americans. As he evolved as a writer, his political sensibilities increasingly informed his depictions of the U.S. classes in the latter decades of the 19th century. His plays are mostly farces and feature wealthy people engaged in matters of relatively trivial importance which they magnify to crisis proportions. 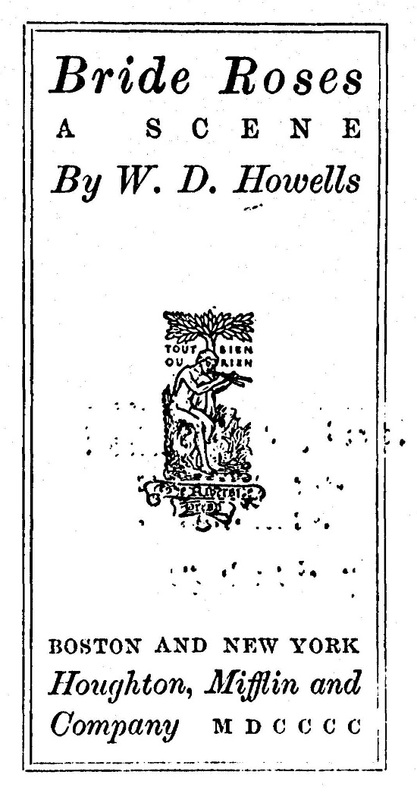 This month’s release of Nineteenth-Century American Drama: Popular Culture and Entertainment includes more than 20 of Howells’ plays which seem to have been written to serve as theatrical amuse-bouches. It is striking that most of them feature the same characters all of whom are clearly wealthy, maintain servants, and have ample time to turn social molehills into mountains. The titles alone are an indication of the prosaic nature of their pampered lives: The Smoking Car, The Sleeping Car, The Albany Depot, and Evening Dress to name just a few. In each of these farces we encounter Mr. and Mrs. Roberts and Mr. and Mrs. Campbell. Mrs. Roberts is Mr. Campbell’s sister. 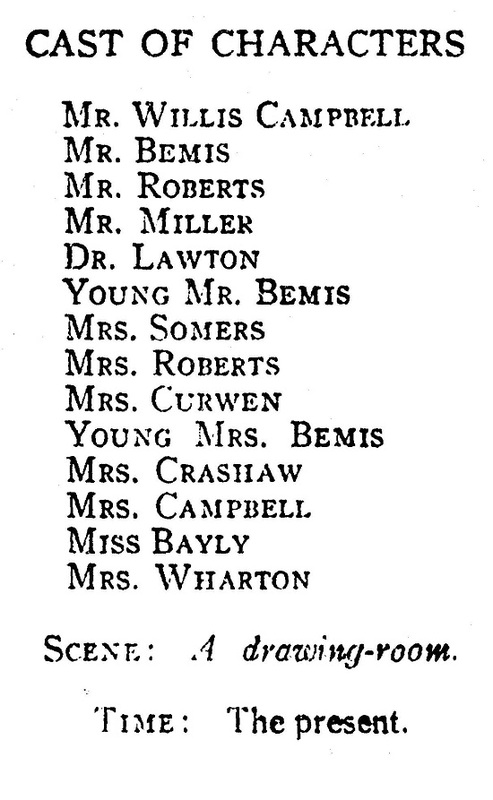 Episodic appearances are made by Aunt Mary (Mrs. Crashaw) whose niece is Mrs. Roberts, Mr. and Mrs. Bemis, Young Mr. Bemis and wife, Dr. Lawton, and Jane the serving girl. Mrs. Roberts. Do you always take down your back hair, aunty? Mrs. Roberts. Don’t you wish she wouldn’t advertise it as human hair? It sounds so pokerish—like human flesh, you know. Aunt Mary. Why, she couldn’t call it inhuman hair, my dear. Mrs. Roberts is apprehensive about meeting her brother, Willis Campbell, for the first time in twelve years. It doesn’t stand to reason that if he’s been out there for twelve years, ever since I was a child, though we’ve corresponded regularly—at least I have—that he could recognize me; not at first glance, you know. He’ll have a full beard; and then I’ve got married, and here’s the baby. Oh, no! he’ll never guess who it is in the world. At a stop in Worcester Mr. Roberts unexpectedly boards the train and begins to search for his wife with the trying assistance of a porter. At some point the increasingly distraught husband remembers that his wife will have a baby with her. With this information the porter is able to lead Roberts to the right car. Confusion, including a misplaced baby and mistaken identity ensues. Mrs. Roberts waxes and wanes but is ever on the edge of hysteria as she is reunited with her husband. Finally, in the manner of most farces, it all comes right. Willis and his sister and brother-in-law are happily reconciled. 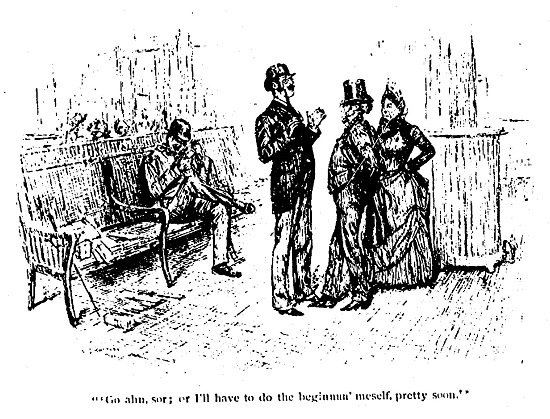 Thus, is Willis Campbell ushered into a reoccurring role in many of Howell’s other farces. The Campbells and the Roberts all appear in The Smoking Car wherein each displays characteristic traits. Mr. Roberts is typically vague and preoccupied. At the top of the play, Howell sets the scene. In the smoking-car of a suburban train on the Boston and Albany Railroad, in the Albany Depot at Boston. 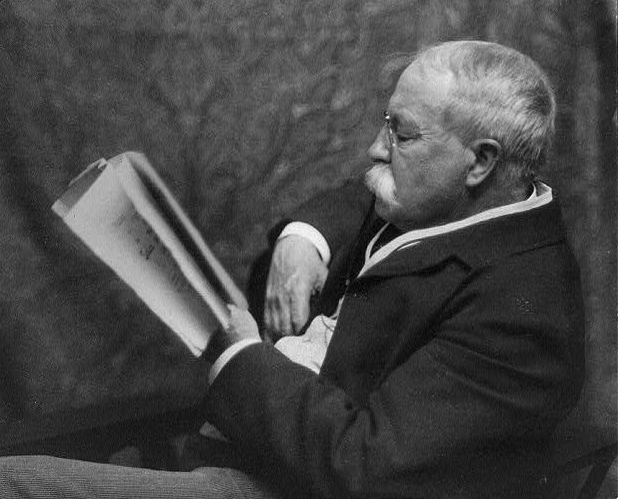 Mr. Edward Roberts is seated, deeply absorbed in a book which he is reading. He has a pile of newspapers and magazines beside him, and he rests an absent hand on them. 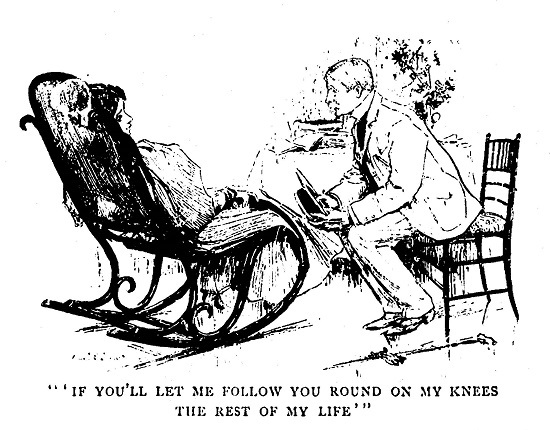 The seat in front is opened toward him, and he keeps a foot against its edge with the effect of laying claim to it, while a Young Mother, with a child in her arms, enters hastily and looks distractedly about. There is no one else in the car, and after walking its length she returns and addresses herself anxiously to Mr. Roberts. Roberts, starting wildly from his book: “Newton Centre? Why, I don’t know; I presume so; yes. Yes, I think so. I’m going to Newton Centre myself. It is the car for Newton Centre, isn’t it? And here we go again: The Young Mother, after inquiring if the seat across from Roberts is taken and receiving an ambivalent reply, importunes him to let her leave her baby there for “a minute.” After a great deal of fussing and to-and-froing about the time and the destination of the car, the woman prepares to leave. By-by, baby! I’ll be right back. I don’t know but I’d better tell her to look after you. She laughs toward Roberts, as if this were a joke which he must enjoy with her, and vanishes through the door of the car just as Mr. Willis Campbell enters by the door at the other end. He walks down the car toward Roberts, approaching him from the rear. Upon discovering the baby, Campbell soon suggests that it has been abandoned and congratulates Roberts on having adopted the child. Campbell helps Roberts resolve that he must search for the mother including the suggestion that “you might try leaving it at the package window.” Mrs. Roberts and Mrs. Campbell enter the car and discover Willis who informs that Roberts has a baby and is in search of its mother. After a great deal of confused circumlocution, the group is surprised to see Roberts return with the baby stimulating yet more confusion. The ladies prevail upon Campbell to take the baby and resume the search. He returns having left the infant with the matron in the ladies’ room. At this point Mrs. Campbell resolves that she and Willis will keep the child and sends her husband to retrieve it. He succeeds. Just as all seems resolved, the young mother returns and explains at tedious length her tribulations. Finally, all is resolved, mother and child are reunited, and the two older couples are able to relax and congratulate themselves. Having exhausted the playwright’s store of commas and semi-colons, the lady is ready to expiate on the qualities of the cook she has engaged and admonishing her husband to be on the lookout for her. At long last, she departs only to be replaced by Willis Campbell. Unsurprisingly, the search for the cook by the brothers-in-law results in consternation and physical peril caused by mistaken identity. Having determined that an older woman conformed to Mrs. Roberts’s description of being “a butterball,” Mr. Roberts approaches her and is met with anger. 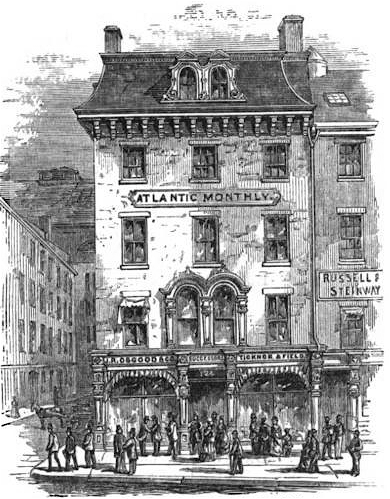 Soon she returns with her belligerent husband in tow who is described as “a small and wiry Irishman, [who] is a little more vivid for the refreshment he has taken.” There are tense moments at first, but in time the belligerent is able to see the humor in Mrs. Roberts’ having tasked her husband with a nearly impossible task, and they all, including the offended woman, join in on the joke. The couple depart, and the men engage in futile discussion about looking for the cook. It comes to naught. Mrs. Roberts returns and characteristically natters on and on about her mission. She pauses in her recitation long enough to upbraid the men’s failure to find the cook. Once again, in the manner of most farces, all is happily resolved when the real cook presents herself, and they all bundle off on their train. 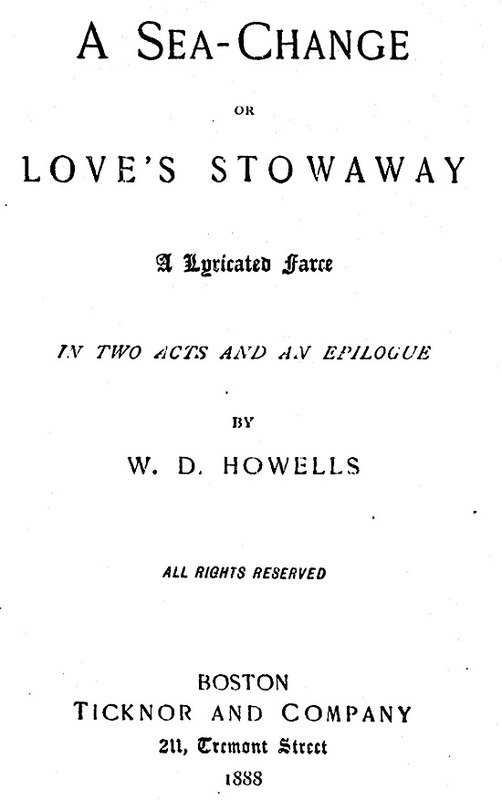 These are but three of the many plays by Howells found in this new digital collection. They are depictions of manners presented as farcical. Reflecting the literary accomplishments of the author, they are well written, sometimes witty, and well-structured. Each is a slice of the mundane lives and worries of the privileged classes. Likely, Howells knew these people, and likely, he did not admire them. For more information about Nineteenth-Century American Drama: Popular Culture and Entertainment, please contact Readex Marketing.